Bob the Builder is a children's television character created by Keith Chapman. 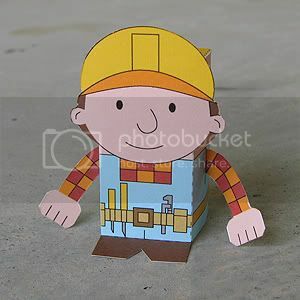 Bob appears as a construction contractor in a stop motion animated programme with his colleague Wendy, various neighbours and friends, and their gang of anthropomorphised work-vehicles and equipment (all made of clay). The show is broadcast in many countries, but originates from the United Kingdom. Awesome blog. Can I link this on my blog? I like everything here. Also I like the Bob the Builder. Do you happen to have Wendy and the rest of the crew and the other characters?